These mouth-watering promotional M&Ms come in a tin with a hinged lid. What’s more, the custom M&Ms Tin looks so good and tastes even better. A win, win! Looking for a way to leave your mark with clients while on the go? Our branded M&Ms Tin might just be the ideal product for you. The portable container makes it easy to bring around in your laptop bag, briefcase, or even in your purse. Once you open the tin, you are greeted with all the vivid colours that M&Ms are known for. It’s a great treat not only for your eyes, but also for your taste buds. 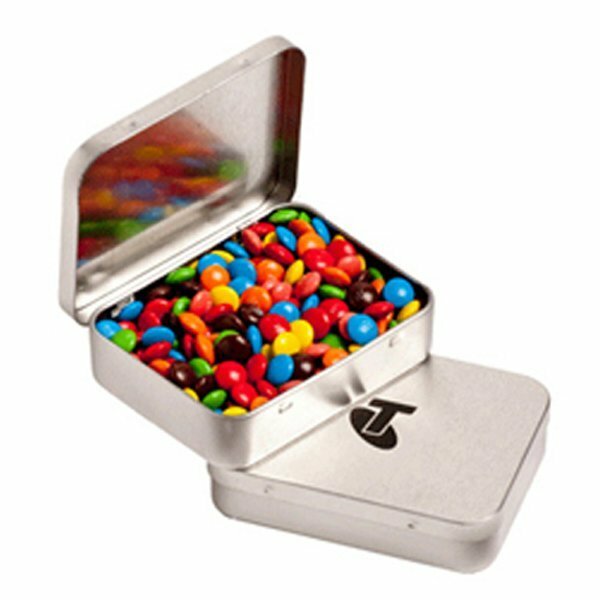 The custom M&Ms Tin comes in a handy silver rectangle tin with a hinge, easy for opening and closing, and keeps the M&Ms inside fresh. The tin is 82 mm wide, 64 mm high and 19 mm deep. This product contains 65 grams of delicious M&Ms stuffed inside. Only mixed colours are available for this yummy chocolate product. The best part about this product is that your company branding will be seen right on top of the tin. The branding will be printing a full colour sticker that will be placed right on the lid. The sticker will be 50 mm wide and 40 mm high. 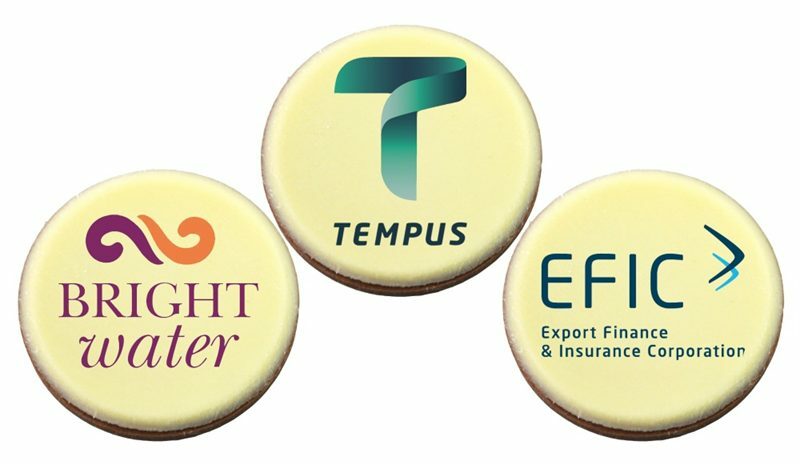 Any logo can be printed using our full colour printing process, regardless of the number of colours. If you’d like to view other options for your Christmas confectionery promotions, we have more delectable M&Ms products in store on our confectionery website. For an eye-catching presentation have a look at the promotional M&Ms Acrylic Dollar Sign. If you’d like other products aside from M&Ms, the customised Choc branded Orange Drops Medium Bucket is a great alternative. Showing off your brand has never been easier with our custom M&Ms Tin! This sleek box and tasty confectioneries will take your brand places! For more giveaway ideas, try out the Toyo Straw Low Profile Mesh Back Cap and our other promotional hats and caps! You can use our live chat app in our website if you wish to get in touch with us quickly. Or you can also call us via our hotline 1300 008 300 to speak to one of our dedicated customer service staff. We will be waiting for your phone call.